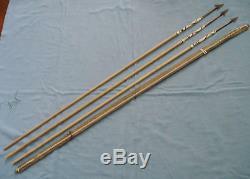 Warao Indian handmade bow and 3 arrows. Warao Indians live on the Orinoco River delta in Venezuela. And made these items in the 1950's. As a means to acquire food. The bow and arrows are approx. 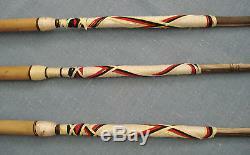 The shafts are made from palm trees. The arrowheads are made of hammered metal. And are attached with dyed string in a colorful design. The string on the bow is frayed at one end. Wonderful authentic artifact for the serious collector. 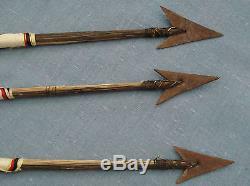 The item "Warao Indian handmade bow & 3 wood arrows metal arrowheads Orinoco Venezuela" is in sale since Saturday, November 28, 2015. 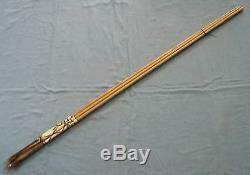 This item is in the category "Collectibles\Cultures & Ethnicities\Latin American\Other Latin Am. The seller is "theplaidalligator" and is located in Longwood, Florida. This item can be shipped worldwide.